I grew up along the banks of the Rock River in the small town of Prophetstown and caught my first smallie about seventeen years ago in a small tributary stream that empties into the Rock River. Since then my "smallmouth addiction" has escalated to grandiose proportions. I now spend almost every free moment chasing the elusive smallmouth in streams and lakes throughout the Midwest. I have fished in excess of thirty streams throughout the Midwest and have also fished many world-renown waters such as Pickwick and Dale Hollow Lake. 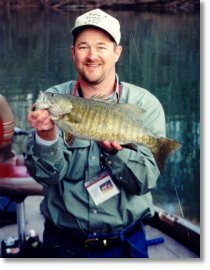 When I'm not fishing, I spend my time contributing to the Illinois Smallmouth Alliance (including a four year term as president of the organization), writing a monthly smallmouth column for the Outdoor Notebook magazine, and delivering seminars on smallmouth techniques and conservation throughout Illinois. Besides being on the Angling Adventures Pro Staff, I am also affiliated with TALS Tackle Packs and the Slider corporation. My grandfather started me out fishing Missouri farms ponds as a child. I could never get in enough fishing as I was growing up. Family vacations for me revolved around what body of water we were going to be near or how far away was the nearest trout stream. My family had a place in Jackson Hole, Wyoming when I was a teenager. That is the place that made me fall in love in fly fishing. I have always loved wading for trout early in the morning, watching the newly hatched insects emerge and struggle to fly only to fall in the water to feed the hungry trout. Since that time I have fly fished for most freshwater species and some saltwater critters as well. Fly fishing for big pike is one of my all time favorite things to do. I have caught hundreds of pike over 40" on the fly with my largest being 47". My next goal is to get a muskie on a fly! I have become a certified muskie nut over the past 8 years. There is nothing more exciting than watching a muskie blast a topwater bait or come in hot behind your bucktail, following all the way to the boat. 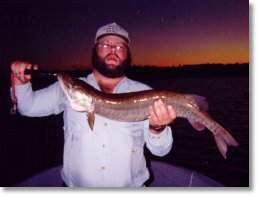 I have always described muskie fishing as "15 seconds of pure violence!" It is quite a rush! We are blessed in Illinois to have outstanding an outstanding muskie fishery. I have also been a tournament bass angler for 20 years. I have fished bass tournaments all over the Midwest. I am a 3 time past President of the Bloomington - Normal Bass Club as well as past President of the Central Illinois Muskie Hunters. I am a life member of B.A.S.S. I love to work with kids or anyone that wants to learn fishing�whether it's learning to fly cast, teaching someone how to fish a Carolina rig or showing how to make a leader for muskie fishing.